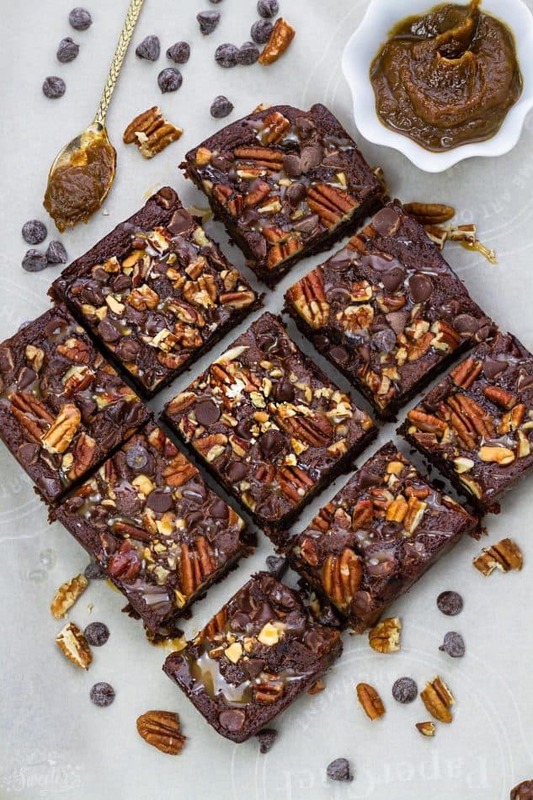 These Paleo Gluten Free Turtle Brownies taste completely indulgent while being secretly healthier and are refined sugar-free. Best of all, this recipe is so easy to make and has all your favorite flavors of Turtles! Melt in your mouth and perfect for any fudgy brownie fans! Turtles. 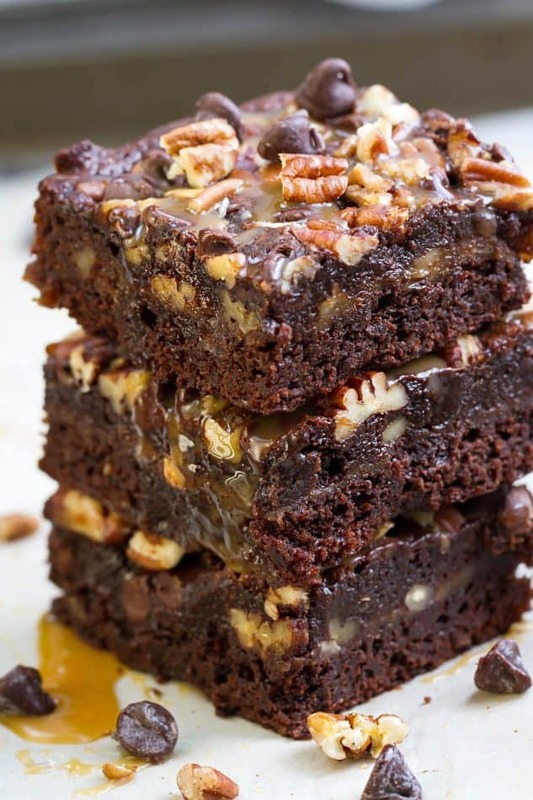 There’s just something magical about the combination of chocolate, caramel, and pecans. Turtles always remind me about Christmas when we were younger. 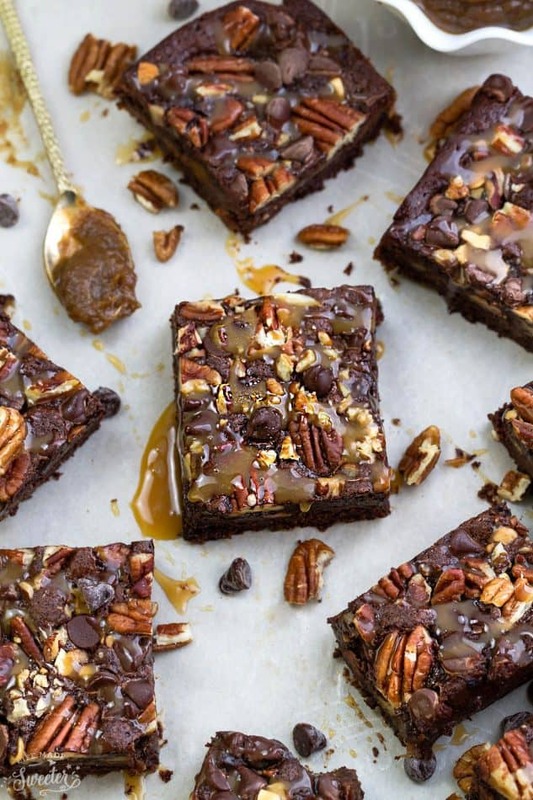 These brownies are packed with all those amazing chocolate, caramel and pecan flavors we love about Turtles, in a refined sugar-free, gluten-free and paleo brownie. 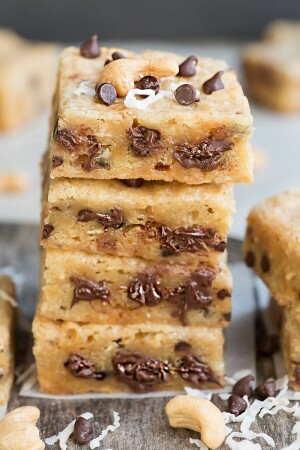 I love that they bake up soft and fudgy while still tasting super decadent….and you seriously can’t even tell that they’re made with more wholesome ingredients. Just look how fudgy – even my husband, who is usually pretty tough to trick when it comes to healthier treats was completely smitten! I used Hodgson Mill Almond Flour because I love their quality and always get great results. This super fudgy brownie base comes together easily in just one bowl. They start with dark chopped chocolate melted down with coconut oil, and then you just add coconut sugar, eggs, vanilla and flour and spread half of the batter into the pan and pop it in the oven for 15 minutes. Next comes the ooey gooey caramel center which is just a combination of dates, water, almond milk and cinnamon. 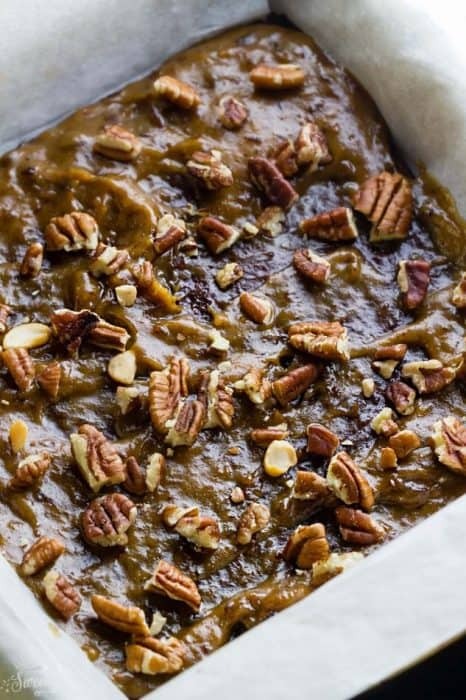 You spread a layer over the brownie base then sprinkle with some chopped pecans for that signature turtle flavor. The remaining half of the brownie batter gets added and then some more chopped pecans and paleo-friendly chocolate chips for good measure. 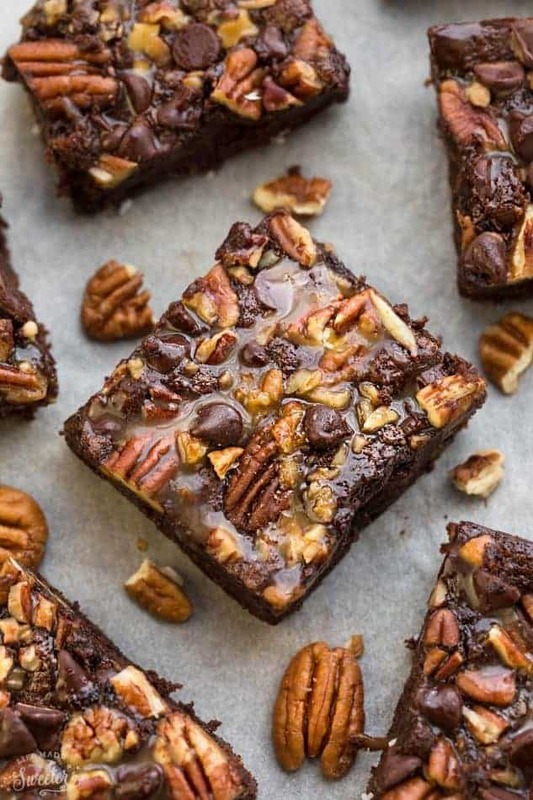 They bake up into these dense, fudgy on the inside, tender on the outside, chocolate- and pecan- studded brownies. Drizzle on another layer of the caramel sauce and they totally pass for the real thing. Disclosure: This is a sponsored post created in partnership with Hodgson Mill. All opinions are 100% my own. 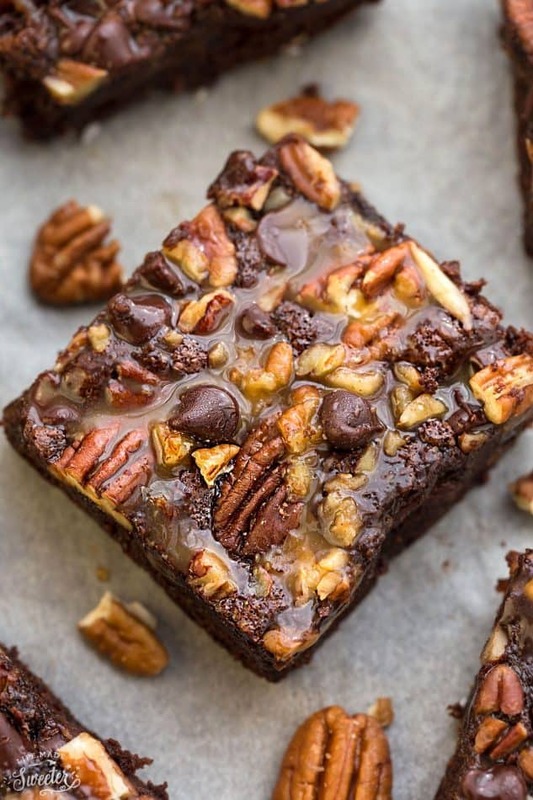 These Gluten Free Turtle Brownies are rich & fudgy and have all your favorite flavors of Turtles. 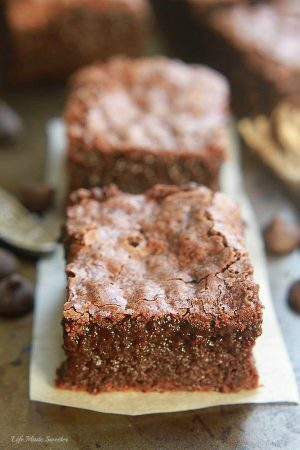 They're refined sugar-free and just perfect for any fudgy brownie fans. Also an option for a paleo-friendly version. Preheat oven to 350 F. Line an 8x8" square baking pan with parchment paper, leaving a slight overhang for easier removal. In a large heat-safe bowl, heat chocolate and coconut oil on high power in microwave in 30 second increments until melted, stirring in between. Whisk in coconut sugar until smooth then beat in vanilla and eggs, one at a time. Whisk in baking powder, cocoa powder and slowly fold in flour until just combined. Spread half of the batter into the prepared pan and set aside other half. Bake in preheated oven for 15 minutes. 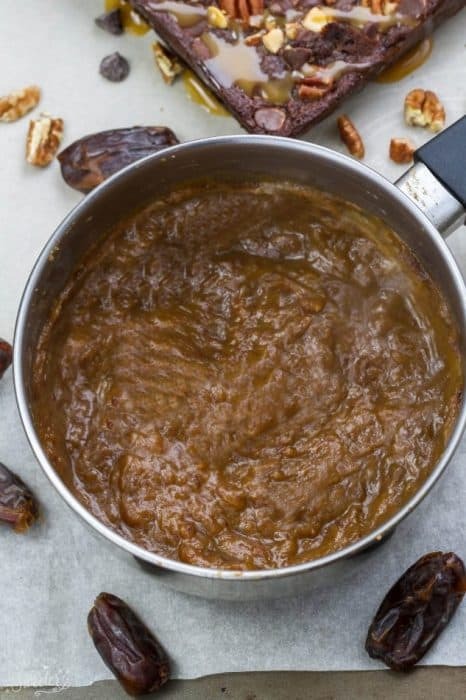 Meanwhile, make the date caramel sauce: Place dates, coconut oil and water in a small pot over medium heat and bring to the boil. Simmer for a few minutes until dates are soft while stirring and mashing down with a fork. Remove from heat and use a hand blender to blend until smooth (alternatively place in a blender to blend). Add cinnamon and enough milk to blend until the consistency of caramel sauce. Return to oven and bake for 25 to 28 minutes, or until center has just set and no longer jiggly. Remove from oven and allow brownies to cool completely before cutting. You can refrigerate or freeze the pan to cool faster. Cut into equal squares with a very sharp knife. Drizzle with reserved caramel sauce, if desired.